I met Professor Kobayashi for the first time in 1972, when I left Japan and entered the Graduate School of Berkeley. During my stay at Berkeley he was kind enough to host a seminar for me, allow me to borrow mathematical books from his home, and consult for my questions about mathematics. What is the most important of all, however, was that he taught me by his example how a mathematician ought to be. In addition to such interactions on mathematics, I was frequently invited to his home, and enjoyed the gracious hospitality by Mrs. Kobayashi and their daughters. I received my Ph.D. degree from Berkeley in 1977, having had Professor Kobayashi as my thesis advisor, and after having spent a year at Bonn, West Germany as a research staff member, I returned to Japan. After then I did not have many opportunities to see him for a while, but since around 1995 the Complex Geometry group of Japan started to organize a symposium at Sugadaira every fall, having foreign mathematicians as invited speakers or participants (We will have its 19th symposium this fall. In the past Sugadaira symposia, we had several renowned mathematicians such as Dr. Y-T Siu and Dr. C. LeBrun). Prof. Kobayashi, in particular, participated in almost all symposia. All lectures were presented in English at the symposium, through which we learned a great deal from Prof. Kobayashi. Incidentally, the photo posted in the home page of the Kobayashi Memorial Symposium was taken by Mr. Bando when Prof. Kobayashi gave a lecture at one of the Sugadaira symposia. This is one of Prof. Kobayashi’s photos that I like most. 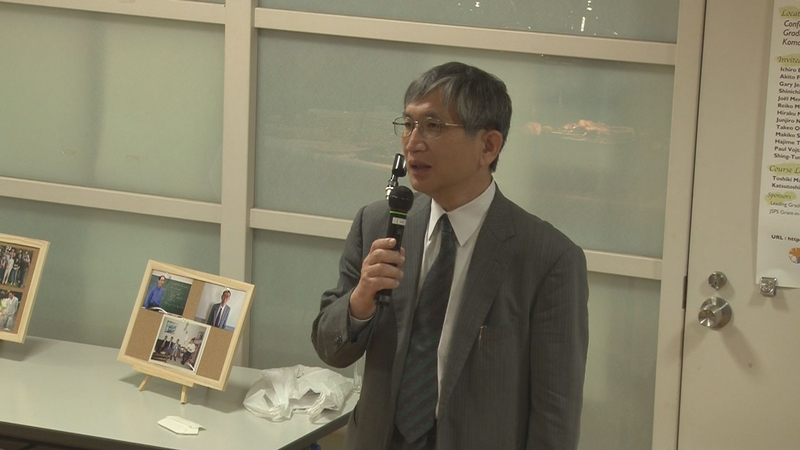 It is an undeniable fact that Professor Kobayashi has gone, but we would like to inherit his strong passion and determination for mathematics, and strive earnestly to work on mathematics. In closing, as one of Prof. Kobayashi’s former students, I would like to express my heartfelt gratitude to Prof. Takushiro Ochiai, Chair of the Organizing Committee of this Memorial Symposium, and his committee members, to Prof. Yoshiaki Maeda, Prof. Makiko Tanaka, Prof. Kentaro Mikami and supporting staff who worked so hard to prepare for this Memorial reception, and to those who came to participate in this memorial reception.